Low overhead? Hey, we invented it. 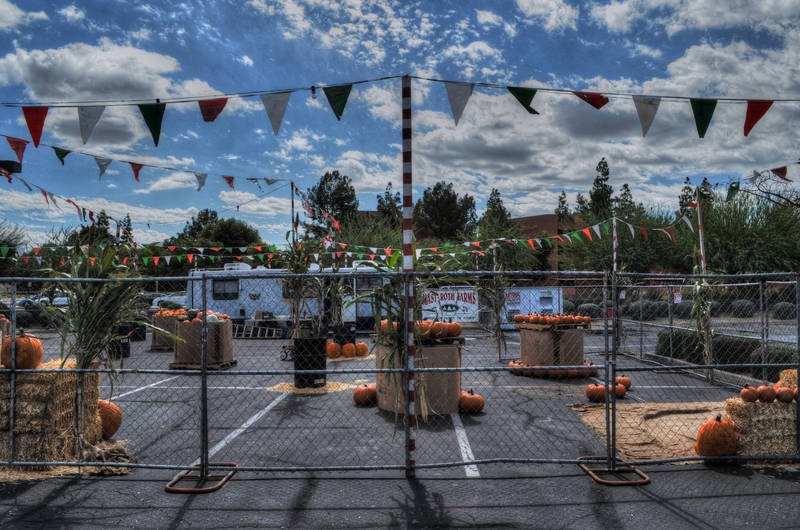 A parking lot, some pumpkins, and opportunity. For the merchants and you. RETAIL CHAINS ARE STARVATION FOR A PHOTOGRAPHER, a barren field where nothing grows, at least visually. America used to be a place where, in our business doings, our petticoat showed a bit; a certain raw vitality showed through our saggy banners, our improvised displays, our homespun marketing. It’s no wonder that the photojournalists of the Great Depression or the choniclers of the Lower East Side of the early 1900’s made poetry out of our back-of-the-truck veggie stands, our horse-drawn pushcarts, our roadside tag sales. There was texture there. There was the real drama of struggle, and it was a pictorial gold mine. Of course it’s not all gone, and we are not, uniformly, Wal-Mart Nation. Not yet. As picture makers, we have so much more to work with looking at the human, the risky, the uncertain in our do-it-yourself capitalism. There are stories in it. There are real people on the front lines of the culture to watch and capture. It’s also a hell of a lot more fun than trying to find drama in the grand opening of, say, Kwikie Mart # 3425. Look Around, See If You Like Anything, I’m Almost Done With My Lunch…. 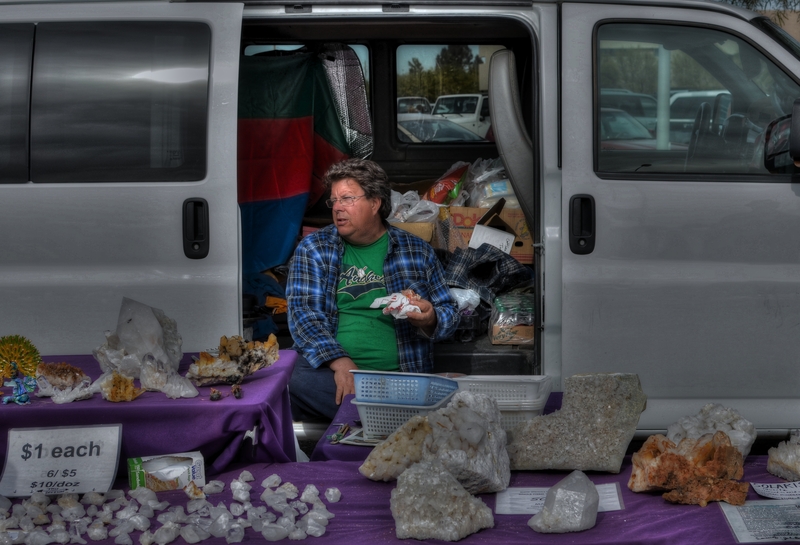 And picture opportunities, created by the blacktop gypsies of our time, are still setting up shop across the country…..six days in a Target parking lot to sell fireworks, four hours in a church driveway to hawk cakes and pies, three weeks in a vacant lot to peddle Christmas trees. And then there are the fairs, the craft shows, and the garage sales, those stubborn little machines of mercantile faith. You can’t not grab gold in these fields. There may be a great epic just waiting to be shot inside a massive wholesale warehouse, but I prefer my drama smaller, and a little more on the human side. Show me a guy trying to make a buck against all odds and I’ll show you a picture. This entry was posted on October 8, 2013 by Michael Perkins. It was filed under Composition, Framing, HDR, Street Photography, Textures, Urban and was tagged with Commerce, Great Depression, Sales, Street Photography, urban.